This iExpression is an alternative to parenting layers. There are two major differences: 1) You can parent single properties only (e.g. only the position but not the scale or rotation). 2) The parenting can be active for a limited amount of time and not necessarily for the entire duration of the composition. This iExpression comes in different variants for 1D properties, 2D properties, and 3D properties. Don't put a number here. Use the link button to link this to some property. is the first frame at which the linking should be enabled. 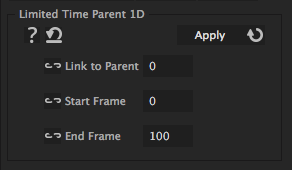 is the last frame at which the linking should be enabled.